Apples and Butter: Chicken Liver Pâté Round ?? 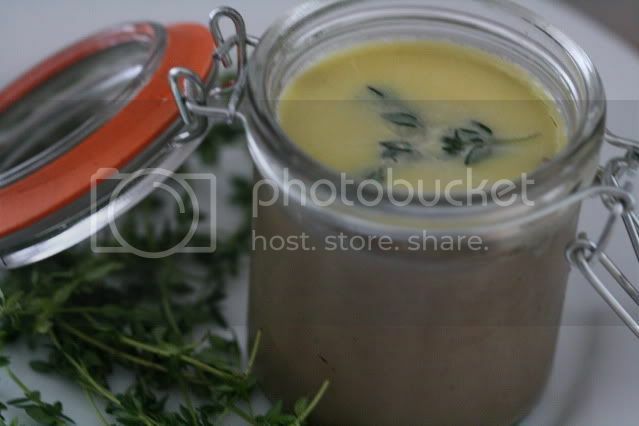 Chicken liver pâté is one of my favorite things to make and to eat. The first time I prepared it, I was living with my parents for a short period of time after graduating from college and before starting to work. I was trying to make up for playing the part of the typical college student who returned home jobless, by making dinner for them on a semi-regular basis. I was just starting to delve into the world of cooking and my meals were always the result of experiments with new dishes. It is unlikely that we ate the same thing twice during those few months. I remember my osso bucco being a particular hit with my father. Of course, there was also the day I fell asleep on the couch while there were chicken thighs braising on the stove. I awoke to a house filled with smoke and some chunks of carbonized, used-to-be-chicken thighs permanently fused to the now ruined pan. Luckily, I was just cooking for one that night and my parents were out of town. The first time I made chicken liver pâté it seemed as if I was embarking on quite the endeavor. After all, pâtés and charcuterie, though delicious, were still a mystery to me and not the sort of things you made at home. My mother assured me over and over again that it was a very simple dish to make, but I did not believe her. It was too exotic. How could pâté be easy? Turns out, it is easy. It is also cheap. A pound of chicken livers is never over $2 and that includes the livers that I picked up from high-end, specialty retailer Eataly, here in New York. Once I discovered how easy it is to make this rich, delicious and often impressive dish, it became part of my regular repertoire. Chicken liver pâté at the holidays, chicken liver pâté to go with every cheese plate, my mom and I even made it for an event during the weekend of my brother’s wedding. We have bounced back and forth between recipes and I am always on the lookout for new ones to try. So, when I saw this latest recipe while perusing Sweet Paul, a visually stunning online magazine, I knew I would be making it that weekend. This is a great chicken liver pâté. I will not go as far as to say that it is my favorite (that title still belongs to this recipe), but it is delicious and, unlike my favorite recipe, perfect for placing in a beautiful jar, under a thick layer of clarified butter and giving as a gift this holiday season. Place the chicken lives in the milk and soak in the refrigerator overnight (24 hours if possible). Drain the livers. In a large pan, melt 3 tablespoons of butter and sweat the onions until beginning to soften. Add the chicken livers and thyme and sauté until the livers are browned on the outside (about five minutes). Season with salt and pepper and cook for one more minute. Add the cognac or wine and cook until almost all of the liquid is gone. Transfer the mixture to a food processor and puree until smooth. Spoon the pâté into six ramekins. For the topping: Melt a stick of butter in a small saucepan. As the milk solids float to the top, remove them with a spoon until the butter is totally clear and you are left with clarified butter (alternately you may purchase clarified butter and melt it until pourable). Cover each ramekin with a layer of clarified butter. Place one thyme sprig in the butter for decoration and chill until solid. May I tell you something? In Italian we say ossi buchi, not bucchi...Have a nice time in New York and merry Xmas! Just found you, fellow Socialvore :) And, wouldn't you know, my colleague's husband is the photographer for Sweet Paul (his name is Colin). She'll be so pleased to see your post when I mention it to her. Beautiful site. I love pate so much. I never made but do order it every chance I get. Now this would make a wonderul gift, wouldn't it? Mmm, I love chicken liver, especially in pâté form. And I especially love the idea of topping it with butter. Yum! :) Happy holidays to you! I was very impressed at all that you'd made for Robert's wedding, but especially the chicken liver pate. Certainly a memorable occasion! I've never even thought about making my own pate before! This looks delicious, and happily easy, so I'll definitely give it a try.